The main reason President Obama needs to cancel the Keystone XL pipeline is as a declaration that we need to stop building more fossil fuel infrastructure. Rather, investment needs to be made in more wind and solar electricity generation, and the electrical grid needed to help balance the supply and demand for electricity. It needs to be a symbolic decision -- a statement that the United States wants to be in the forefront of mitigation of greenhouse gas emissions, and that we do not want to invest in construction of a system to prolong the burning of oil for energy, with its concomitant carbon dioxide pollution of the atmosphere. The next step is for Secretary of State John Kerry to make a recommendation to the president. As a politician who understands the global warming problem and who has campaigned his entire life to address climate change, here is his chance to do the right thing. I hereby strongly urge him to recommend against the Keystone XL pipeline. This is a great opportunity to stand up against fossil fuel interests and do the right thing for our country and our planet. There are many arguments in favor of and against building the Keystone XL pipeline from Alberta, Canada down to refineries on the U.S. Gulf Coast. But none of them are a compelling argument in its favor. Take employment. 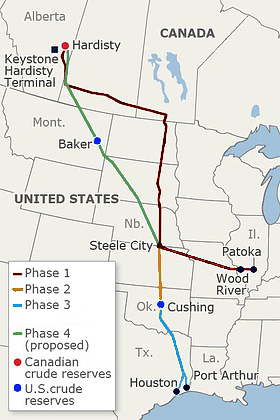 Indeed building the pipeline would create about 4,000 temporary construction jobs, but only about 50 people will then be employed operating the pipeline. Wouldn't it make much more sense to hire people to construct wind turbines, install solar panels, and build the new electric grid we need? Wouldn't it make more sense to invest in battery technology and the other developments we will need for a fossil-free future? Processing tar sands is a dirty business, locally for Alberta and in the refining. It will pollute the atmosphere with even more CO2 than ordinary oil, already a major pollutant. The oil will cost more to produce and buy. We need to leave it in the ground if we are to solve the global warming problem. While the total CO2 emissions from this oil are a small percentage of current total global emissions, we need a rapid downward trend in CO2 emissions to avoid dangerous climate change, not another tick upwards. The recent State Department report on this takes a very narrow view of this issue, not the broad one that is required. Are pipelines safer than trains and trucks for transporting this dirty oil? Clearly all these forms of transport can have messy accidents, as we have seen recently. If the pipeline is not built, will we have many more train accidents? If it is built will we have more catastrophic pipeline leaks? The answer is to not transport the oil at all, and when we do, to regulate it and require many more safeguards than now present. This, in the short term, will make the oil more expensive and serve as an important deterrent to its transport. The Keystone XL pipeline will not increase our energy security. It will transport oil from a foreign country to U.S. refineries, which will then export the oil to other foreign countries. There is no good argument for building the Keystone XL pipeline and a strong argument to say, "No." Secretary Kerry and President Obama, do the right thing.